Here is a quote from a “scene setter” report on health inequalities which went to the March 2018 Board of NHS England. Yet this table from the same report presents a different picture – positive progress? Sometimes the language of bureaucracies dispirits me. We often get bland statements – that basically say – “no cause for worry we have fulfilled our legal duties” when we actually need a rallying cry….. This paper is a good illustration of why we lack this rallying cry. There are two significant omissions to this report. 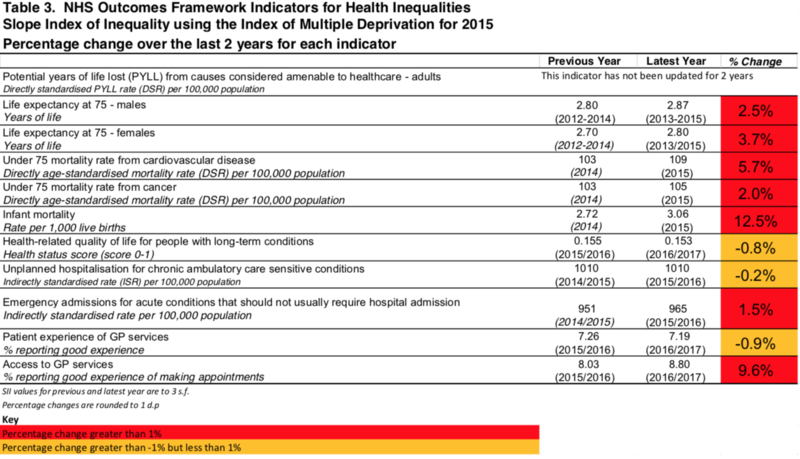 There is no definition of what is meant by health inequalities – and following on from this there is no mention of the context within which health inequalities currently exists in the UK. We have to come clean and say that health inequalities is avoidable disadvantage experienced as a result of peoples socio-economic status. 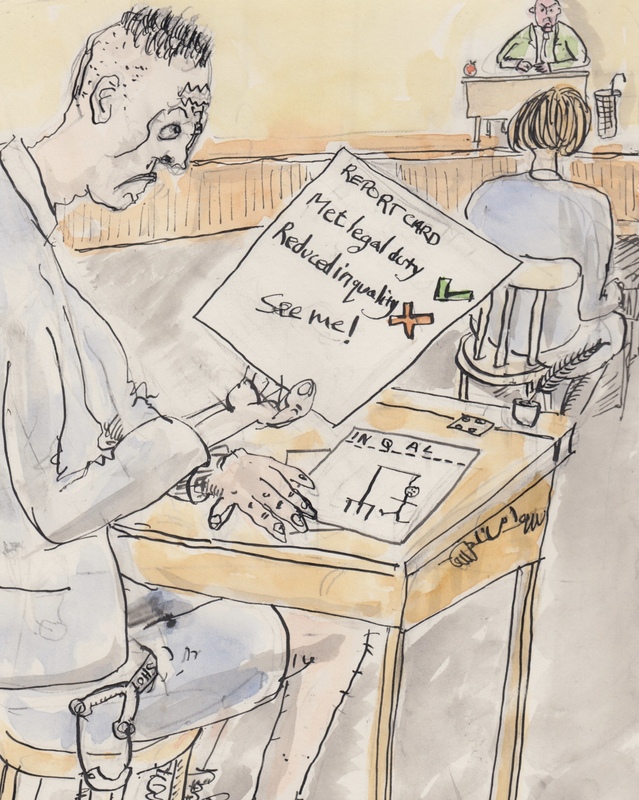 Of course there are other disadvantages that people can experience as a result of their disability, race, gender, age etc but these equality issues are not synonymous with inequality. A note on context – we are in the middle of a period of severe cuts to local government and other services that are intended to tackle inequality – see here (Guardian – local govt cuts), here (JRF report) and here (Guardian – benefit cuts). This scene setting paper mentions none of these issues – yet it promotes integrated care systems! Lack of a coherent narrative. This paper has lots of facts – its starts using an ONS classification that I was not familiar with. This breaks local authority areas down into a set of categories – supergroups – for example “services and industrial legacy” and “Business and Education Heritage Centres” etc. Later the report compares “most deprived areas”to least deprived – I think by population groups of 100,000 population. I know this issue is complex but I come away confused and unclear about the scale of the population affected and lack an insight into what this means at a population level. The different approaches are confusing and risk repeating the mistakes made by the Labour Government Spearhead Programme. It focussed on local authority areas which have a high proportion of people who experienced health inequalities (a bit like the services and industrial legacy group), however cities like Sheffield were not recognised because the proportion of people who experienced health inequalities was smaller, even though the actual number of people who experienced health inequalities was larger! Further in the report health inequalities is described according to condition – Cancer, mental health etc. This exemplifies the siloed approach of the NHS commissioning model. It appears as though though we are talking about different populations with regard to health inequalities – when of course we are not. 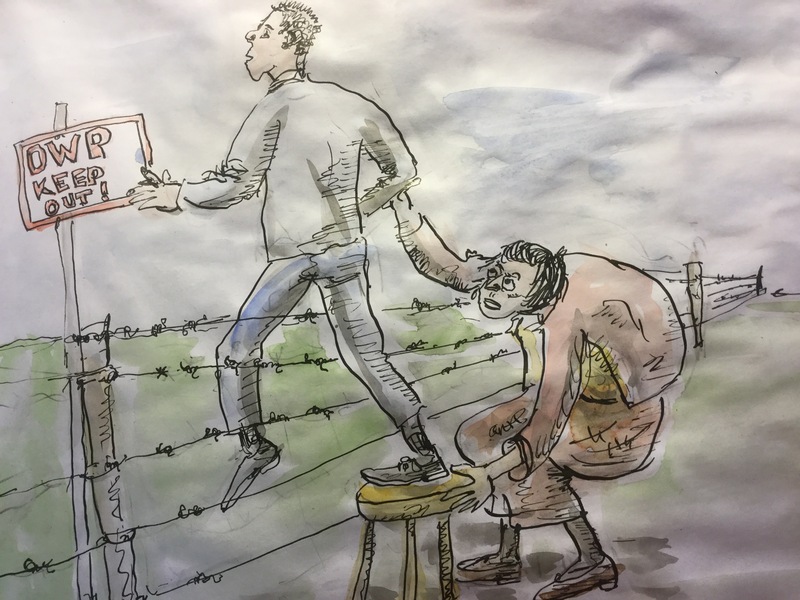 This is particularly the case if we take into account the burden of disease that people who experience health inequalities carry at an earlier stage in their lives – see this blog from Peter Hoskins editor at Conservative Home! 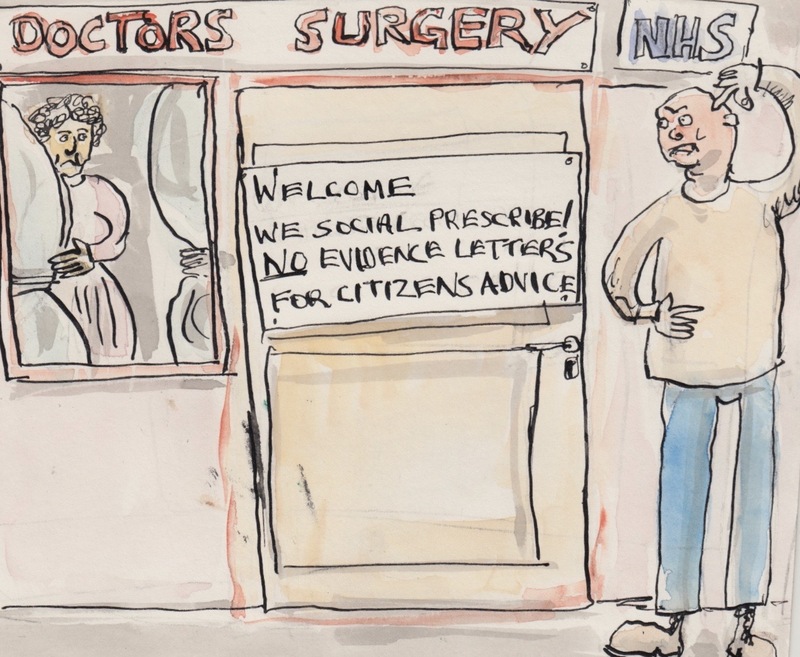 It feels as though NHS England is scraping the barrel here while there are a range of initiatives mentioned it acknowledges that many of these are pilots, it mentions the Improving Access for All toolkit which I critiqued here, and Social Prescribing. Its hard to see why other initiatives such as Personal Budgets (with just 23k people on them!) are included – is NHS England saying that this is a programme specifically addressing health inequalities? It does talk about the need to review the financial allocations formula – which is positive – however I suspect that this will take a rather long time and without a decent analysis of inequalities (see above) is unlikely to deliver. NHS England need to work with the Local Government Assocation and key organisations such as the Institute of Health Equity, Joseph Rowntree, Citizens Advice, the Money and Mental Health Policy Institute and the Royal College of Psychiatrists to produce a coherent narrative that sets out the health inequality challenge – everything else follows from that. Articles by Mike Kelly former Director of the Centre for Public Health at the National Institute for Clinical Excellence are always worth a read. He has just published one in the Journal of Public Health which looks at the role of evidence-based public health guidelines in local government. 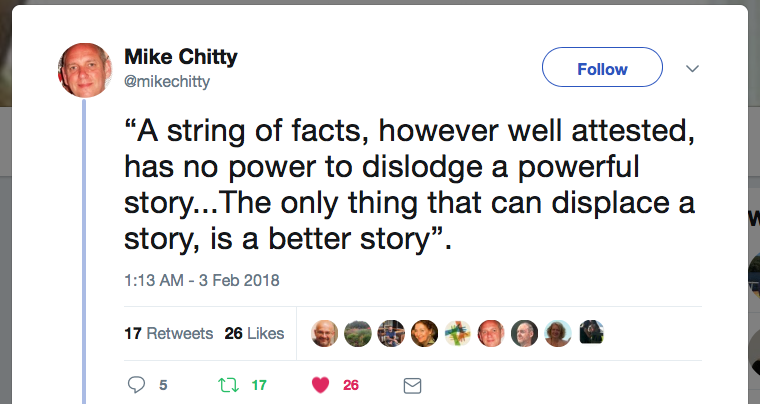 One of the points that Mike makes is that councillors have a much broader view of evidence than the NICE model whose approach has its origins in evidence based medicine, peer reviewed literature etc. He notes that elected members must also take into account a range of other factors – such as their local knowledge and the views of their constituents. 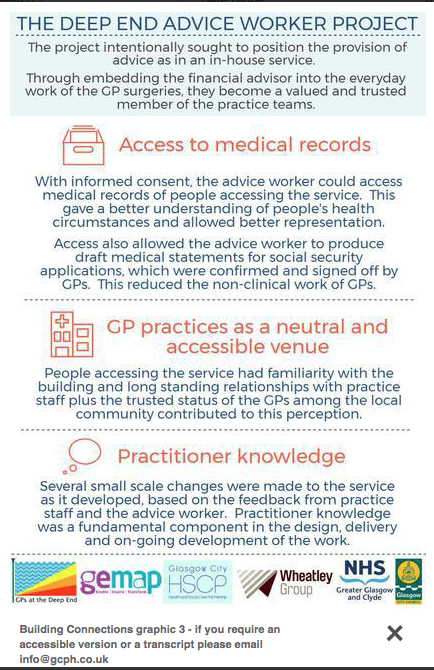 NICE guidance is still mainly for the NHS. The NHS is essentially a collection of services – and despite various attempts to make it more accountable locally it is really an aggregation of different clinical health specialisms bound together by a post war policy commitment – these are managed by NHS England on behalf of the Department of Health. 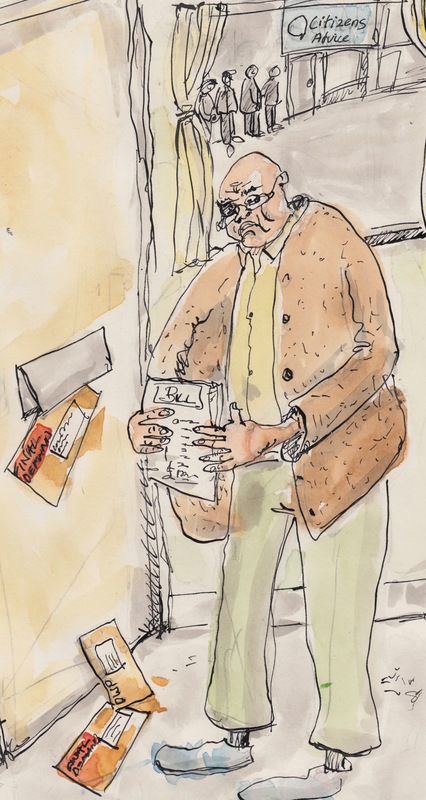 Being a collection of services – the focus is on delivery. Respective governments have created a performance management system that focusses on individual service performance rather than their total impact on population health. NICE guidance works in this policy context. Most NICE guidance focusses on areas 1 and 2; however, NICE Public Health Guidance for understandable reasons has a greater focus on areas 2 and 3. Even here emphasis is more on services rather than systems. 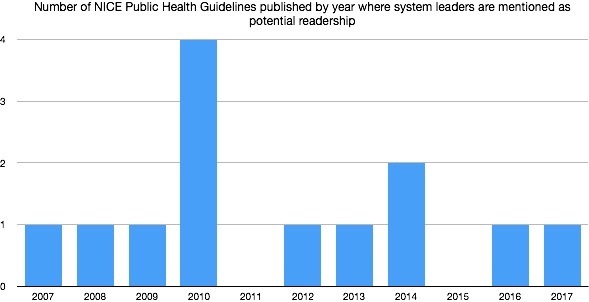 I have looked at the 65 NICE public health guidelines of these only 13 specifically mention that the intended readership includes system leaders such as elected members, Health and Wellbeing Boards, Local Strategic Partnerships etc. My working out is here. Most NICE guidelines are operational and conservative. By this I mean they tell us what is already known. The aim is to ensure that good practice is used consistently. 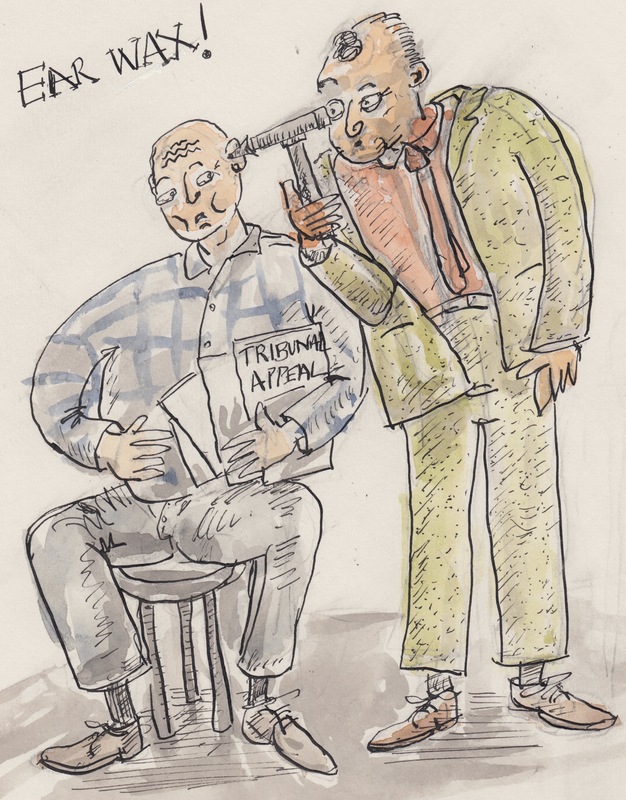 It’s not surprising that elected members are largely unaware of them – most are not aimed at them and those that include them are produced infrequently. Local Councillors head up significant local democratic institutions who use their mandate to ensure that the interests of their population are served. They are responsible for shaping what it feels like to live in that area, the local authority power of wellbeing is a recognition of this. Many are trying to improve health and reduce health inequalities in a world that doesn’t work according to the same rules as NICE guidelines. It is quite understandable that local councillors have little interest in much of the guidance that is produced by NICE. 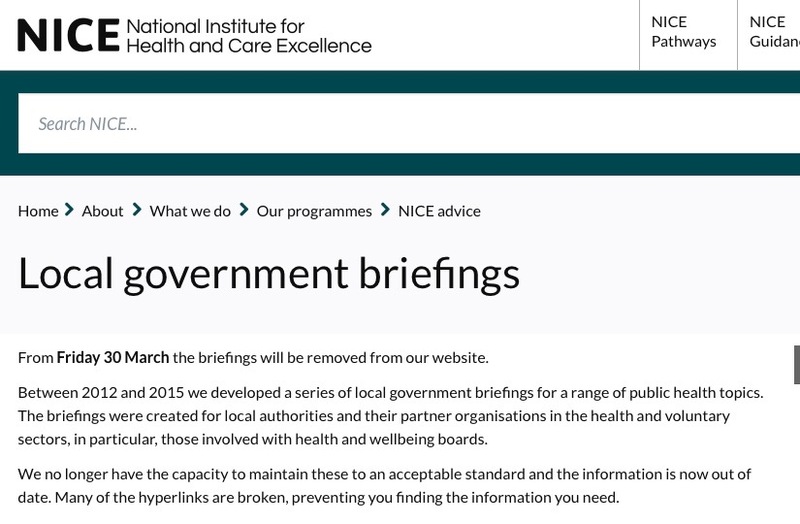 Having said that I think that when it existed the Centre for Public Health at NICE must have recognised this problem because they produced a series of Local Government Briefings that attempt to speak to local authorities in their system role. While I think they still struggled with the operational nature of NICE evidence nonetheless they strike me as an attempt to reach out to system leaders like Councillors. Councillors are primarily concerned with strategic challenges which can include structural inequalities, access to employment, financial insecurity, social cohesion, health and care system integration etc. The stronger the evidence the narrower the topic – NICE guidelines are more likely to focus on operational issues rather than strategic ones. 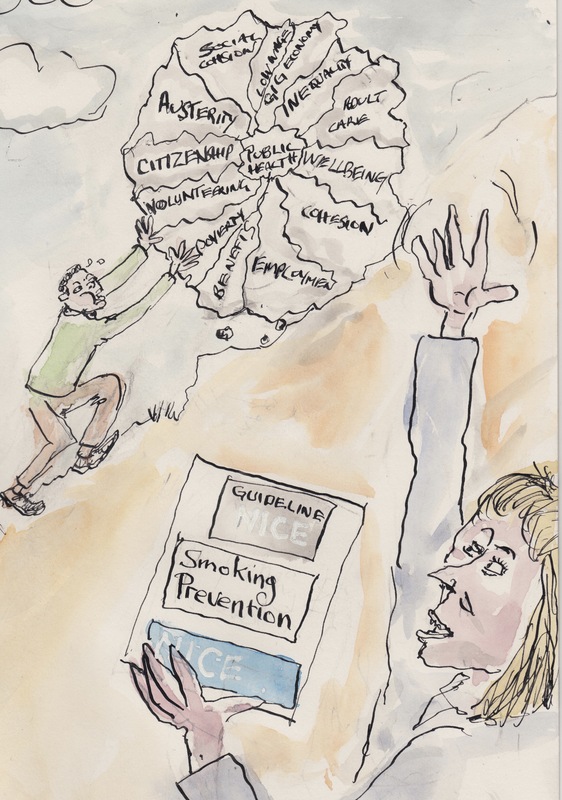 The problems are strategic, complex and in the here and now – NICE guidelines are built on the past and the evidence base for primary preventions is weak -s ee UKPRP Rationale. Expertise from peers and faster moving think tanks like Happy City (Thriving Places Index) the LGA (The Power of Place – role of Health and Wellbeing Boards) and even the Health Development Agency feel more relevant. 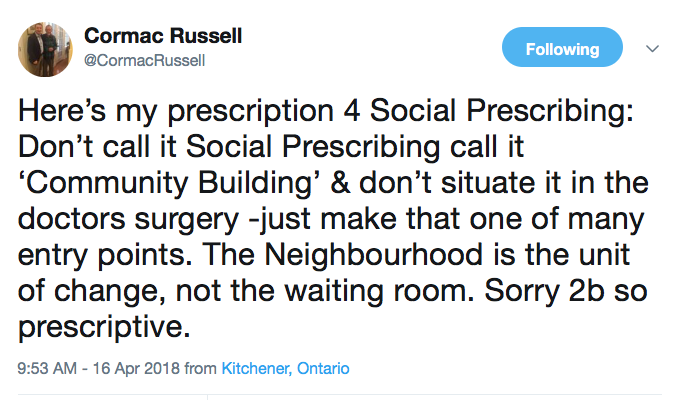 Some topics that worry local councillors just don’t get onto the NICE list of approved topics because its not a government priority. Like every one who works or is a trustee in the voluntary sector I worry about funding. It struck me recently that it not just the scale and stability of the funding that is important but what it represents. Funding for Citizens Advice Bureau ultimately comes from two main sources. Local Government and Central Government – compared to other local voluntary organisations there is relatively little funding support from charities. It is striking that local authority funding support has generally held up – despite the terrible cuts to local government funding government. Services tailored to particularly stressed communities such as economically disadvantaged neighbourhoods, Gypsy and Travellers, Deaf People, Migrants, people with Mental Health Problems and so on. All of these services are important but I think there is a real difference in the focus of these two funding streams. In general central government is interested in services that are relevant to the whole population and are focussed on the relationship between the citizen and non-governmental services. Both the Money Advice Service and Consumer Advice are good examples of this. They are primarily concerned with empowering individual members of the public to take more control of their relationship with private sector organisations, whether those are financial institutions or providers of services and goods. Much of local authorities funding is concerned with helping people who are on low incomes and often with some degree of vulnerability to navigate their relationship with the local and national state – in particular with departments and organisations that are meant to meant to be there to help but too often make it hard to access their services. The most important aspect of this is how Citizens Advice Bureau help people access the Department of Work and Pensions or to challenge decisions about entitlement. I now think that there is a fundamentally important distinction here. Local Authorities choose to champion and invest in local services which help people address deficits in national government policy. In this case services that are concerned with helping people to access a key national support service – the welfare benefits system which national government too often manages in a way that is designed to stop people getting the support they are entitled to. …and it will be local authorities that provide the funding to help the large number of people access help when they have to navigate Universal Credit. 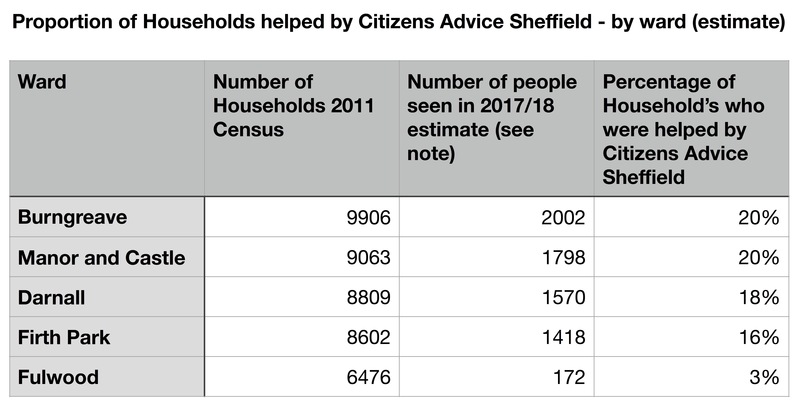 This is why local authority funding support to Citizens Advice Bureau is so important and needs to be valued and appreciated for the beautiful thing that it is.